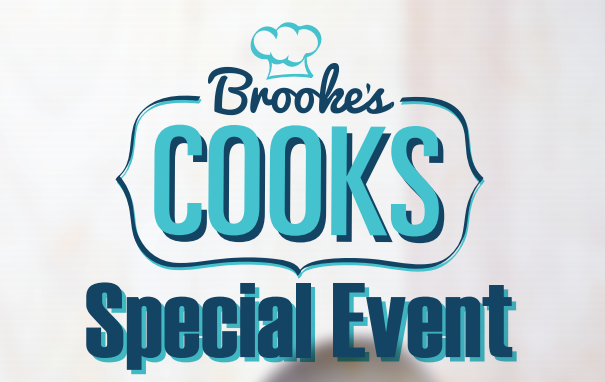 Stay Tuned for Upcoming Brooke’s Cooks Events in 2019! Click Here for information and photos of the 15th Annual Benefit! Click Here for information and photos of the Read-a-thon! Click Here to See Photos and Winners From The Race! Brooke Jackman Foundation celebrated its 14th Annual Benefit on October 15, 2015 at the Mandarin Oriental in New York City. Click Here to See the 14th Annual Benefit e-Journal! Click Here to See Photos from the Benefit! To Learn More & Donate, Please Click Here. We launched the Summer By Brooke campaign in 2015 to bring parents and children top summer books, recipes and nutrition tips all season long! Check out more campaigns like Summer By Brooke by following us on our Facebook and Twitter! Check out photos from the 2015 10th Annual Race For Literacy! Click the image above to review this year’s Gala journal. Thank you to all of our sponsors, supporters and donors. 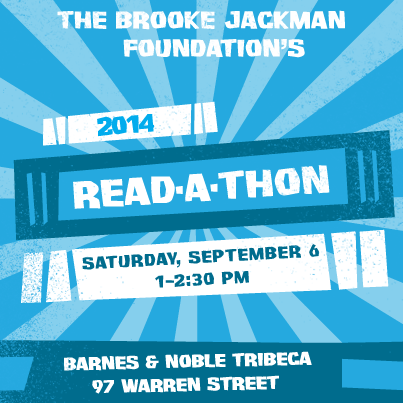 The Brooke Jackman Foundation Read-a-thon is a free event for children of all ages that celebrates the positive, transformative power of literacy and commemorates more than a decade of instilling the love of reading into hundreds of children throughout New York. 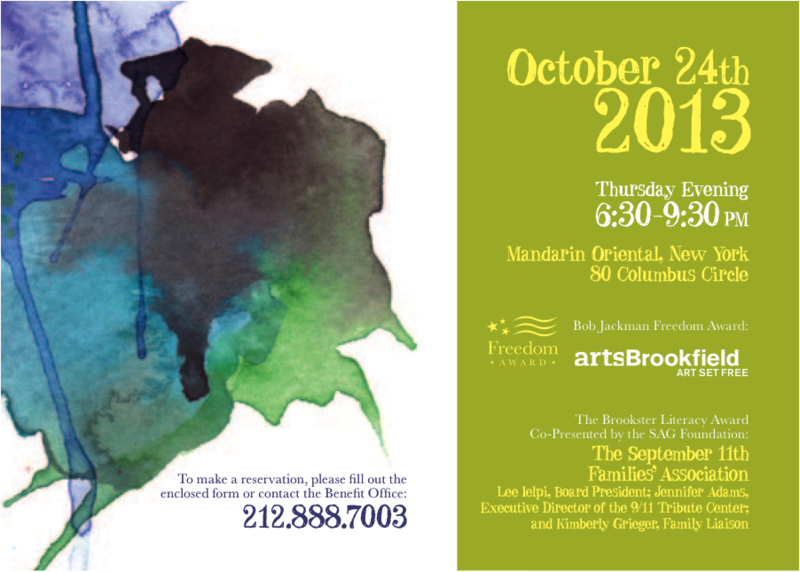 Special guests include New York Fire Commissioner Daniel Nigro, celebrated children’s author Stephanie Calmenson, Broadway stars, and more! Congratulations to Overall Men’s Winner Nick Mavros and Overall Women’s Winner Pamela Hunt-Thomas! To view the overall race results, click here. ABC What Help Means to Me is available for purchase online for $20. All proceeds will support BJF’s many programs that promote literacy among at-risk children and build their self-esteem through learning. 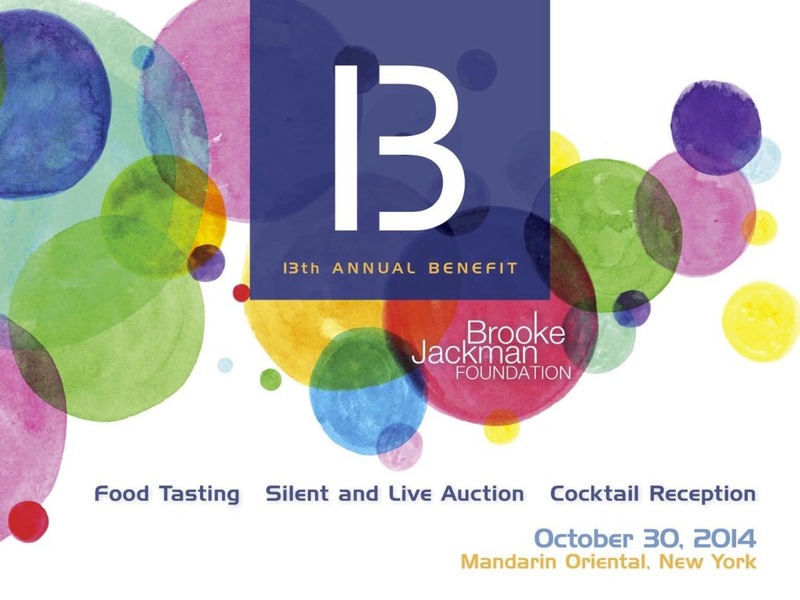 On Thursday, October 24th, 2013, the Brooke Jackman Foundation hosted its 12th Annual Benefit Gala at the Mandarin Oriental at Columbus Circle. There was a silent and live auctions and food tastings by NYC’s finest chefs from Asellina, Bittersweet New York City, Brick Lane Curry House, Hospoda, Preserve 24, Radicchio, Stumptown, Sweet Chili, TBar Steak & Lounge, TriBeca Grill and Zio. On Saturday, September 7, the Brooke Jackman Foundation hosted the 4th Annual BJF Read-a-thon to help make the magic of literacy and the love of books a reality for disadvantaged children in New York. The Read-a-thon was held from 12 – 1:30 p.m. at Barnes & Noble Tribeca in Manhattan. For a copy of the race brochure click here. To see this year’s race route, click here. This holiday season, Barnes & Noble Tribeca is once again supporting the Brooke Jackman Foundation as the beneficiary of its upcoming Bookfair, December 7-9. Shop at B&N Tribeca December 7-9 Bring our special voucher (Download), or just mention “Bookfair” at the register. All proceeds are donated to The Brooke Jackman Foundation Promoting Literacy for children. Costumes make great party favors & party themes! Summer vacation season is here, but we’re definitely not taking any time off – the Brooke Jackman Foundation is currently in the midst of preparing for our biggest and best annual fundraising gala yet! This year’s event will be held at the Mandarin Oriental on October 11, 2012. There will a tasting of delicious treats from some of our favorite restaurants around the city, a bevy of beverages to quench your thirst and an array of highly sought-after auction items to bid on. Click here to buy your ticket, become a sponsor or buy an ad in our event journal. For the third year, the Brooke Jackman Foundation will be inspiring families through literacy with its annual public Read-a-thon. This is a free event for all ages that celebrates the positive, transformative power of literacy. 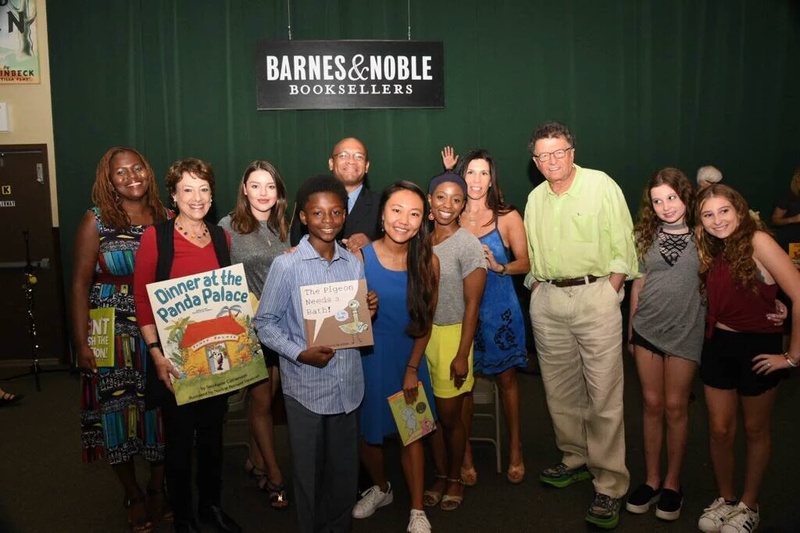 An array of guest readers will bring the words on the pages to life as New York area children, their families and the community gather for an afternoon of books and bonding. With each determined step, the runners in the 7th Annual Brooke Jackman Race for Literacy 5K Run/ Walk raised money to support literacy for at-risk children on Saturday, May 19 in Oyster Bay, Long Island. The 3.1-mile race, a USA Track & Field-certified course, ran along scenic roads of Oyster Bay, Mill Neck and Upper Brookville, and was professionally timed by Tri and Du It Multisport using the Mylaps Pro Chip Transponder timing system. For the past seven years, hundreds of runners have donned their sneakers to raise money for the Brooke Jackman Foundation, the non-profit organization created by the Oyster Bay-based Jackman family that promotes literacy for underserved children in the greater New York area. For results click here. Throughout March and April, all of the loyal supporters of the Brooke Jackman Foundation cast their votes to win thousands of books for their children’s schools in the “Books 4 Our School” challenge-and now the winners are finally in! As more and more school systems throughout the metropolitan New York area are facing budget cuts, with the possibility of losing the vital educational resources that their students need to succeed, the Brooke Jackman Foundation teamed up with NYMetroParents to give area schools a solution that will stock school libraries with thousands of books, while encouraging parents to showcase their support for literacy. Parents throughout New York City, Long Island, Westchester and Connecticut realized they needed to take matters into their own hands and rallied to advocate for their children’s education. Each of these 20 winning schools will receive 75-100 brand new books for their libraries! To ensure that we can continue to provide engaging community initiatives and supplying much needed school supplies to our area’s underserved children, please consider donating to the Brooke Jackman Foundation today! Through January 1, 2012, books that were purchased or donated through this store were distributed directly to the children in our many Brooke Jackman Foundation literacy programs as holiday presents. These gifts were received by children in underserved communities in and around the New York area who have been victims of domestic violence, are living in homeless shelters or are a part of our other programs. Winter Garden at the World Financial Center – December 9-11 When Santa checked his list to see who was nice last year, the Brooke Jackman Foundation was right on top! To help us celebrate the season, Santa read books to children and posed for photos, in the Winter Garden of the World Financial Center during a three-day celebration. From Friday, December 9, through Sunday, December 11, Santa brought his elves along for his annual stay at Santa’s Winter Garden, posing for photos with kids and listening to their Christmas wish lists. The Brooke Jackman Foundation organized its Tenth Annual Cocktail Reception and Auction on Thursday, October 27, 2011 at The New York Palace Hotel. The event included food tastings from well-known chefs and lively music. Amazing silent and live auctions took place, including bids for trips, jewelry, golf courses, sports and theatre tickets and fine dining, just to name a few. The evening also payed tribute to our founder Bob Jackman. In memory of his leadership and guiding force, the newly established Freedom Award was presented to a true leader, Daniel Keating, Chief Operating Officer of Samuel A. Ramirez & Co, Inc. In commemoration of 9/11 and its own 10th anniversary, the Brooke Jackman Foundation held its second annual Brooke Jackman Foundation Read-a-thon – a Celebration of Literacy and Hope on Saturday, September 10, 2011, at the Winter Garden in the World Financial Center in Lower Manhattan. 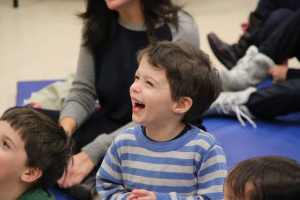 The free event was hosted by Arts World Financial Center (www.artsworldfinancialcenter.com), and celebrated the positive, transformative power of literacy. For 50 days (excluding weekends), The Brooke Jackman Foundation shared fun activities to keep children reading over the summer. The campaign encouraged children and parents to read and write in creative ways during a period of traditionally low reading rates. Continuing to build your children’s literacy skills during this period is extremely important. Studies show that reading up to 6 books per summer maintains or improves children’s literacy skills, while children who read 0 books per summer can drop up to one grade level in reading skills. 1. Practice writing skills with your children today! Help them write a letter to their favorite author. 2. Combine social time with reading time. Schedule a play-date between your child and friends so they can swap books! 3. Going on vacation this summer? Hit the local library with your kids and find books for them to read about where you’re going. 4. What’s your child’s favorite author? Make a list of his or her books and see how many your child can read this summer! 5. Combine nutrition and reading! Go to the library with your kids, pick a healthy cookbook, and make the tastiest dish you find! 7. Go through a family photo album and ask your child to write a story to go along with the pictures. 8. Happy 4th of July! After today’s celebration, have your children make a list of adjectives to describe their day. 10. Ask your children where their dream vacation would be. Then, go to the library and find books on it! 11. Find your child a pen pal! Whether it be a relative, friend, or yourself, letters are a fun way to build literacy skills. 12. Go to the zoo with your children. Afterwards, find books to read on their favorite animals. 13. Take your children food shopping. Pick out foods based on their favorite colors and have them write descriptions of the items. 15. Help your children design their own stationery and have them write letters to a person of their choice! 17. Have your child start a summer scrapbook. Fill it with pictures and stories collected from this summer’s adventures. 18. Teach your children pig latin! It is a fun and effective way to practice writing and spelling skills. 19. Hit the beach or lake to collect shells/rocks with your kids and find a nature book to read up on the treasures they’ve found. 21. Have your children make a list of their favorite summertime fruits. Then, ask them to put the list in ABC order. 22. Prove that reading isn’t always so serious. Ask relatives what their favorite joke is and write a joke book with your kids! 23. Have your kids write with friends today! Ask someone to start a story and pass it around for others to add to it. 24. Pass time in the car by playing word games! Choose letters and ask your kids to find words for each letter on passing signs. 25. Wrap a book and give it to your child as a gift! A book that is a gift can stir up excitement about reading it. 26. Pick a bedtime story to read with your child tonight. Take turns reading each page for maximum reading engagement. 27. Get creative! Take an old shoebox and decorate a “book box” with your child. The box can hold your child’s favorite books. 29. Start a book club with your children and their friends. It will encourage reading, and allow the expression of opinions, too! 30. Have your child return the books they swapped with their friends. Facilitate a discussion on which books they liked best. 31. Make an ABC Book: Have your children pick an adjective starting with each letter of the alphabet to describe themselves! 32. Pick out a fun poem to read with your children today. Then, act it out! 33. The school year is approaching fast! Ask your child to write their own school supplies list to practice literacy skills. 34. Our #50DaysOfSummer is almost finished. Review the summer reading chart from day 1 with your children and celebrate all they’ve accomplished!